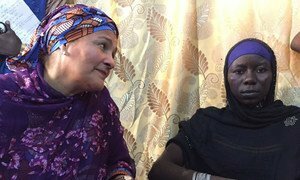 Ms Mohammed was speaking at a meeting with the Nigerien president, Mahamadou Issoufu, on Saturday in the capital Niamey which was part of a joint United Nations -African Union (UN-AU) mission to the country. “I stressed to the President the importance of women’s participation and leadership in preventing conflicts,” she said. “I also underlined the need to include women in all national and regional responses to the ongoing environmental, humanitarian and development challenges that Niger and the Sahel region face." The deputy UNchief is leading the UN-AU visit to Niger, which includes many of the most senior women in the UN, the African Union, Special Envoy on Women, Peace and Security, as well as the Foreign Minister of Sweden, Margot Wallström.